This year I’m again participating in the Clarion West Write-a-thon. My goal is to practice my writing craft skills on a series of short stories. 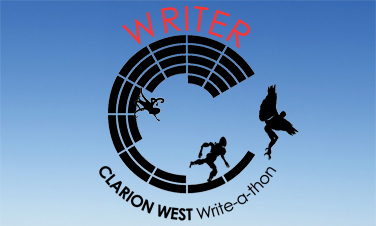 The Write-a-thon is a fundraiser for the Clarion West Writers Workshop. If you wish to donate to Clarion West in my name, go to my writer’s page and click on the Sponsor Lester D. Crawford button. 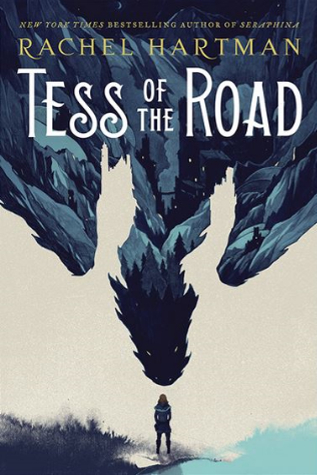 Another book that caused me to evaluate my writing is Tess of the Road by Rachel Hartman. 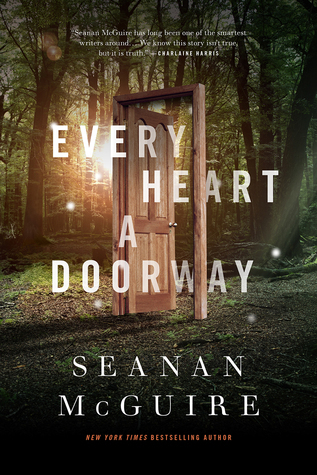 This story occurs in the same universe as Hartman’s Seraphina and Shadow Scale duology, but it is not a third book of a trilogy. It is the first book of a new duology centered on a new character, Tess. Having multiple stories in the same universe is something I do, but that is not what struck me about this story. What enthralled me was Hartman’s use of setup and payoff. She introduces objects, cultures, characters, or concepts at organic moments in the story where learning about these items fits perfectly. However, the payoff is later when those items reappear at a pivotal moment in the story. Since we have already learned about them, the story charges forward without pausing to explain. I like the way Hartman does this. I, too, do this to some extent, but I could use with some improvement. Some writers say they simply start writing having no notion about the story. They simply let the flow of words dictate where the story goes. I do something similar when I brainstorm, but when it comes to writing a story, I’m structured and organized. In my IT career, I was the same way. I would experiment by writing code heuristically, but when it came to creating a computer application, I performed detailed analyses and design — figuring out what the application would do, how it would do it, and what the end result would look like — before cutting code. As I’ve developed my writing craft skills, I’ve become a strong believer in story structure. 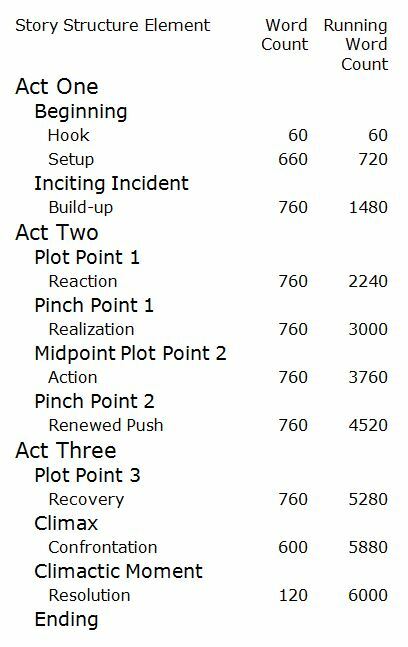 The approach I’m using on short stories is to decide on the target word count, determine the word count for each step in the story structure, and then organize an outline for the plot points. This means that at every point in the story, I know how many words are needed, which allows me to know I’m on target for staying near my word count goal. The items in the outline can contain very little or a great deal of information, typically from my brainstorming sessions. For example, for a recent short story, the Reaction step (the first quarter of the second act) said, “Boy talks with Friend about his plan to slay dragons. Friend tries to talk Boy out of trying to slay dragons.” From that I needed to create 760 words. This is where discovery writing comes into play; and, magically, it came together. It was thrilling. Often, as the writing progresses, more ideas reveal themselves requiring adjustments to the outline, but those normally fit. Story elements that occur in one area turn out to be useful in another. And foreshadowing events pop out to help unify the story. I spend time every evening exploring story ideas, but once those ideas are solid, I find having structure and an organized plan makes the writing of those ideas fun, and I always know where I’m going. On Halloween, a news story led me to a NASA recording called “Chorus Radio Waves within Earth’s Atmosphere.” The sounds are the data recorded by the Electric and Magnetic Field Instrument Suite and Integrated Science (EMFISIS) aboard NASA’s Van Allen Probes. It was supposed to sound spooky. In the first book of my “The Dragon Universe” series, the protagonist is injured and abandoned in a forest, but he does not know he’s on an alien world. That first night, the forest is full of sounds the protagonist has never heard before, sounds that frighten him. This audio file flooded me with feelings of that first night. The challenge I face is capturing those feelings in words. Events early in my childhood left me with certain personality traits regarding food insecurity. I think of those traits as scars. Talking about them is intensely emotional, the memories bringing tears to my eyes. So many memories. I’ll describe one. I remember being very hungry, sitting at the kitchen table, and being given a bowl of broken pieces of stale bread with a small amount of Karo Syrup poured over them. The bread was hard, but the syrup softened it. I vividly remember picking up the bread pieces with a fork and enjoying them greatly. I enjoyed it so much, as an adult I tried to recreate the meal. It’s not as good if you’re not famished. I learned not to waste food. I learned to worry about not having food. I learned to take advantage of every opportunity I had to access food because I never knew when food would again be available. I learned that starving people do not waste food. I learned that starving people dig in the dirt for every last spilled grain of rice. Where I live, the September 2016 report on food insecurity indicated 42 million people in my country were living in food insecure households with 13 million of those being children. With the political climate as it is now, I don’t know if that report will be produced again because it’s the kind of information the current administration does not want known. And when those same politicians talk about letting children go hungry because it ennobles them and makes them work harder, I become incensed. These experiences inform my writing. All of my stories are touched. In one story about surviving the end of civilization the plot is driven by food acquisition. It’s a part of me I can’t escape. This touched me deeply and expanded my horizons. The lesson about a cup of water applies to food insecurity. The difference between someone who grew up often being hungry and someone who never missed a plentiful meal can be significant: I see the difference between my son, who I never let go hungry while growing up, and me. Attitudes toward food are a means of expressing and exploring characters. But it goes beyond a cup of water and a meal. It applies to everything in life. The haves versus the have-nots. Variations on life experiences and expectations. Different interests, wants, and needs. I passively apply these things to my characters now, but the lesson is to actively include these character defining moments. I am applying this lesson to my writing, expanding how I deepen characters to give them their personalities. Thanks to Sanderson’s blog post and the lesson Jordan taught him, I have grown.